October 31st is just around the corner and you know what that means! Ghosts and goblins, witches and werewolves. Okay, not sure about the werewolves but you get the picture. Costumes to be bought or created, bowls to be filled with candy, lit candles and pumpkins all around, not to mention chaos and pandemonium. Before you get lost in all that, let’s talk senior dog safety for a moment. 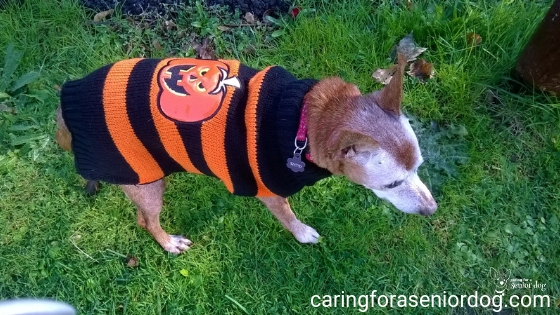 While there are plenty of senior dogs as healthy and ready for action as they were in their more youthful days, there are also many who are experiencing health issues and anxiety. 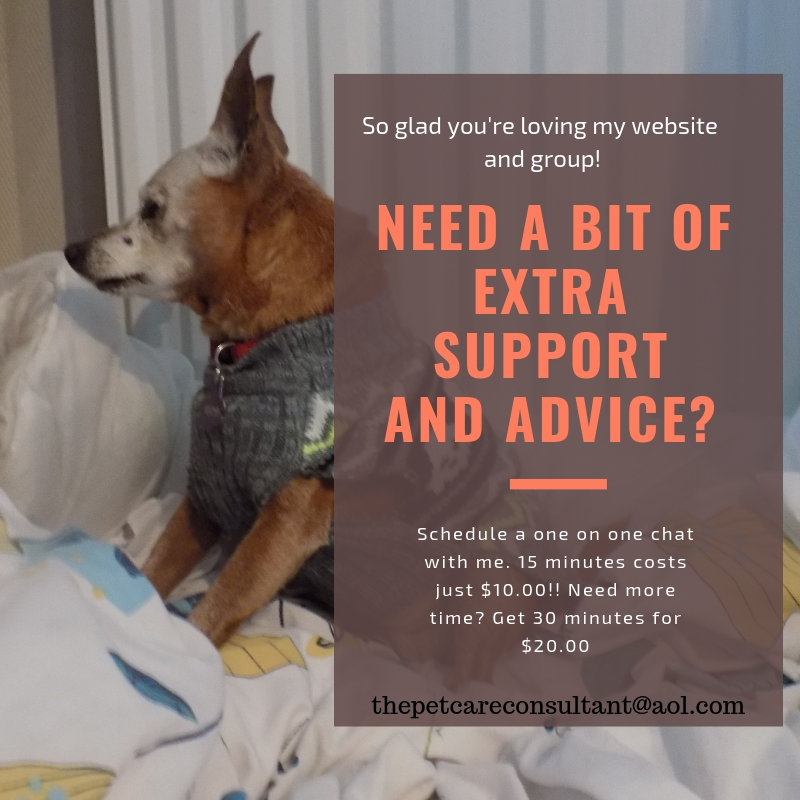 If your dog falls into the “issues” category, as mine always do, keep in mind it can take them longer to recover from a big change in routine or stressors. 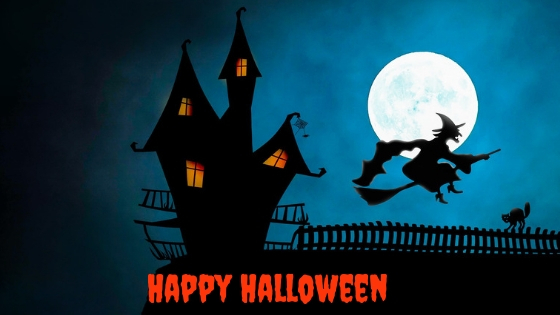 These tips will help ensure a fun time for everyone this Halloween! Chocolate can be deadly, many candies contain Xylitol (a sweetener toxic to animals) and together with wrappers they are all choking hazards. Have everyone in your house at least try and keep an eye on the floor, and if they see anything to pick it up right away. If you don’t think your dog can cope with the constant doorbell ringing and kids screaming “trick or treat” there is a solution. How about putting a sign by the gate asking people not to approach the door because your dog isn’t well, and leave a table outside with bowls of candy so everyone can help themselves. The music, the noise, the people – all of that can be overwhelming for your golden oldie. Setting up a comfy corner in another room where no one will bother him is probably a good idea, and don’t forget to check on him periodically. Alternatively perhaps he can spend a few hours at the home of a trusted friend or family member. If he will be walking amongst you, please warn everyone they are not to give your dog any food because of the risk of stomach upset or even, heaven forbid, pancreatitis if the food is fatty. If you can’t guarantee your “no feeding the dog” policy will hold, it is safer to “dis-invite” him to the party. Lit pumpkins or candles in the house are an accident waiting to happen. Any dog can easily knock them, get burned or cause a fire. If your dog has vision problems, is totally blind or even wandering due to dementia for example, the chances of something bad happening are even greater. Keep the pumpkins outside and use candles with fake flames or make sure they are out of reach. If your dog acts up or is being uncharacteristically naughty, don’t take your frustration out on him because none of this is his fault. He’s worried or anxious and simply reacting to what’s going on. I mentioned this briefly in the section about parties above, but it does bear repeating. Bell ringing, door opening and closing, scary costumes, screaming kids. 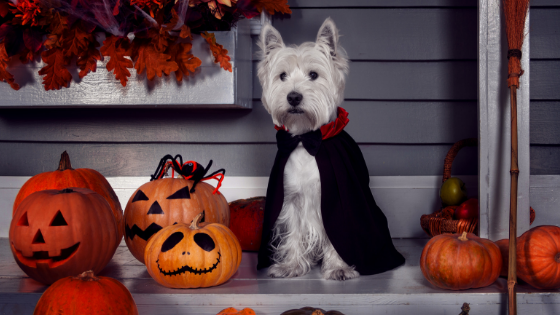 All this chaos can be stressful, so keep your dog safe and calm by confining him in a quiet part of the house until trick or treat time is over. Make sure he has a comfortable bed, water and a favourite toy. If you’ll be having company, don’t force your dog to be in the middle of all that and tolerate being petted and hugged. Of course he’s beyond handsome and you want everyone to see how absolutely fabulous your dog is, but too much attention can be overwhelming. If he doesn’t like or want it let him go and be. How about preparing a stuffed Kong to keep him busy? Maybe a family member or someone else close to you will volunteer to keep your dog company…and distracted. If you haven’t gotten around to this (which I hope isn’t true!! ), now is the time to microchip your dog and get him a collar and ID tag. If he has all that check the contact details are up to date. With the door opening and closing so many times, there is a real risk your dog can slip out without been seen. Should that happen, heaven forbid, you want to do what you can to increase the likelihood of him being found and returned quickly. In order to make sure your dog doesn’t miss one of his outings, you might want to consider moving up his evening walk to just before dark. He’ll be able to enjoy it in a calm fashion, and won’t be spooked by spooks! 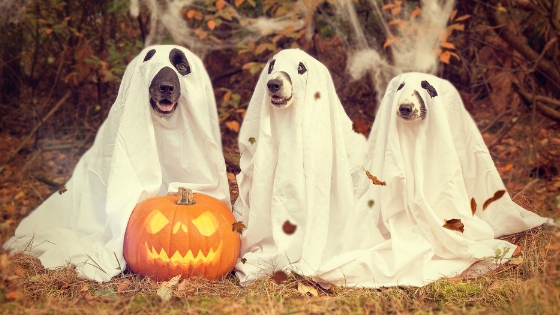 Even if your dog loves to spend evenings in the backyard, Halloween night should be an exception. Vicious pranksters have been known to tease, injure, steal, and even kill pets on that night. Halloween lights and other decorations should be kept out of reach. Cords can be chewed causing an electrical shock, burns or fire, and decorations knocked over or swallowed. Pumpkins, corn, glow sticks and the like should also be kept away, as blockages or choking can occur if large pieces are swallowed. I recommend always having important phone numbers like poison hotline, 24 hour emergency hospital and of course your vet, in an easy to reach place that everyone knows about. If your dog does eat something she shouldn’t have, or you even suspect she has, knowing who to call can be the difference between a happy outcome or a sad ending. I don’t wear a costume but I do like to dress the dogs up. Red was such a good natured dog she was always tolerant but never really impressed by any of it! If you still want your dog to get into the holiday spirit and a costume isn’t the way to go, a Halloween themed collar or bandana will work just as well. 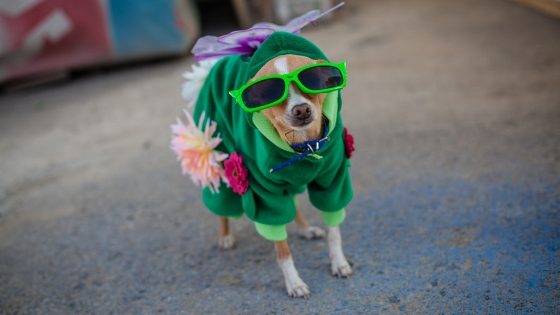 One more thing – how will your dog react to you being in costume? 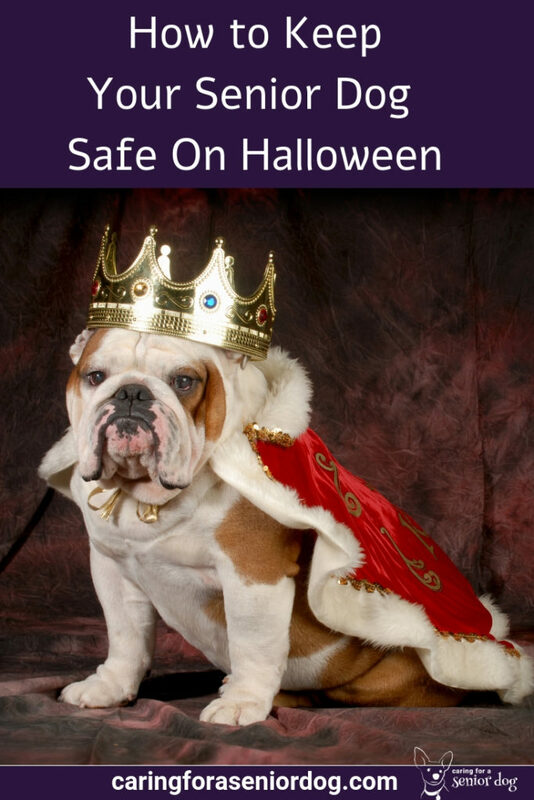 So there you have it, my Halloween dog safety tips. What do you do to make sure it’s a fun and safe night for everyone? Sharing helps others so let us know in the comments section below. Great post, Hindy! Our seniors need some extra thought as things that once maybe did not bother them, sure can as they age. I don’t put my Huskies in costumes, but rather festive headbands, bandanas, and they will tolerate a hat, but it better be cute! BOL ;-). Thanks Dorothy. Red was so easy going I could dress her in anything. The last couple of years I just put her in Halloween sweaters, since she wore one anyway every day, I figured it was easier to stick with the holiday theme. I agree, if your dog doesn’t tolerate things like he used to, a themed bandana or collar are fine too!